Sketch of Japanese defensive positions in Santo Tomas, Batangas in 1945. Image source: Military Intelligence Bulletin Volume III Number 12. From a declassified United States military intelligence document1, we get an idea how soldiers of the Japanese Imperial Army set up defensive positions in the town of Santo Tomas, Batangas in 1945 in anticipation of the arrival of troops of the United States Army. 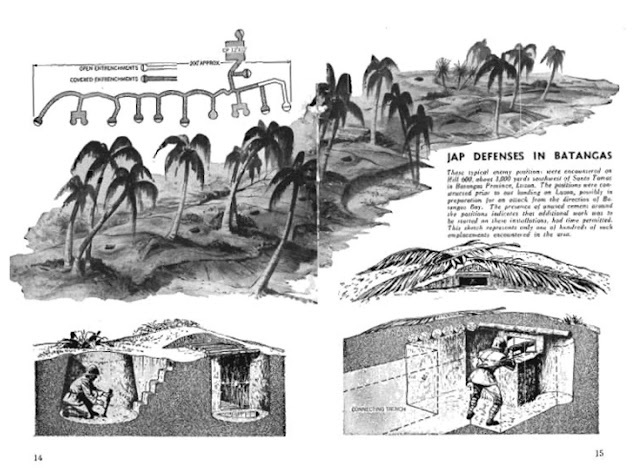 The document, a publication of the Military Intelligence branch of the United States War Department, was published to “present lessons about enemy tactics, techniques and materials.” One section of this particular document, entitled “Jap Defenses in Batangas,” showed a graphical sketch of Japanese open and covered entrenchments southwest of Santo Tomas. An entrenchment is a ditch or an indentation dug into the ground that is used by soldiers as protection against gunfire. To the upper left of the sketch (below) is a diagram showing an elaborate system of these entrenchments which were interconnected and dug underneath a coconut grove. A sketch of an elaborate system of trenches built by the Japanese in Santo Tomas, Batangas in 1945. These typical enemy positions on Hill 600 about 1,000 yards southwest of Batangas Province, Luzon. The positions were constructed prior to our landing on Luzon2, possibly in preparation for an attack from the direction of Batangas Bay. The presence of armored cement around the positions indicates that additional work was to be started on these installations, had time permitted. This sketch represents only one of hundreds of such emplacements encountered in the area. Indeed, because American forces were already in Mindoro by January of 1945, it was expected by the Japanese that they would make the hop over to Luzon across Batangas Bay. This was why American forces landed in Nasugbu virtually unopposed on 31 January 1945. Japanese defenses were positioned in Tagaytay and closer to Batangas Bay3. The defensive entrenchments in Santo Tomas, we conclude, were built on the assumption that American forces would break through these defenses. 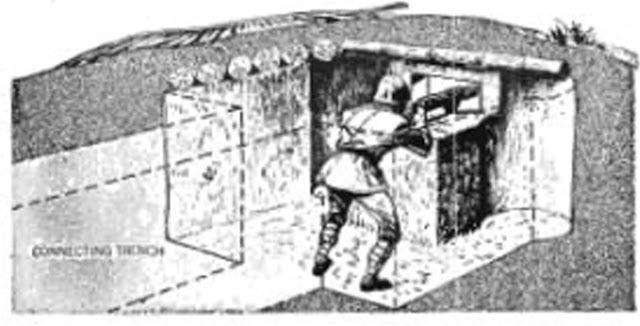 Meanwhile, below, we see a sketch of how Japanese soldiers could descend a short flight of stairs down into a pit from where they could launch mortars4 at enemy soldiers. For obvious reasons, these were the open entrenchments mentioned above, deliberately left uncovered otherwise the mortars could not be launched. The open entrenchments were used by the Japanese for launching mortars. The covered entrenchments, on the other hand (below), were used as bunkers (and therefore called trent bunkers) where machine guns could then be positioned to fire at enemy soldiers. These were then covered with coconut fronds which serve as camouflage (see lower right of second image). Covered entrenchments were trench bunkers with machine gun emplacements used by the Japanese in 1945. 1 “United States Intelligence Bulletin, Volume III Number 12,” published August 1945 by the Military Intelligence Division of the United States War Department. 2 The major landings on Luzon made by the United States Army were on Lingayen Gulf and Nasugbu. 3 United States Army in World War II: The War in the Pacific, Triumph in the Philippines, by Robert Ross Smith, online at Ibiblio.org.